Gail Byers was born on September 21, 1943 in Slayton, Minnesota to Delbert and Doris Grinde Onken. Gail was baptized on October 10, 1943 at the Zion Lutheran Church in Iona, MN. She grew up on the family farm near Hadley, MN and was confirmed on June 30, 1957 at Trinity Lutheran Church in Slayton. Gail graduated from Slayton High School in1961. On April 11, 1964 she and Larry Byers were married at Trinity Lutheran Church in Slayton. Following their marriage they made their home on the Byers family farm until 1975 when they moved to farm north of Hadley where they farmed and raised their three children. Gail was a homemaker until the 1980’s when she went to work at the ASC Office in Slayton. In 1987 she went to work as the Deputy Recorder for Murray County. In 1997 Larry and Gail purchased the Stonegate Apple Orchard north of Slayton. Together they owned and operated the orchard until 2017 when they retired and moved to Slayton. 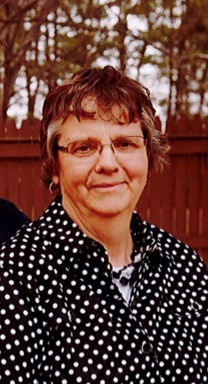 Gail passed away unexpectedly at the Murray County Medical Center in Slayton with her family by her side on Wednesday, March 27, 2019 at the age of 75. She was an active member of Trinity Lutheran Church in Slayton. Gail served as President of the Dorcas Society and was a Sunday school teacher. Gail was an active member of the Slayton community volunteering for A.C.E, the Murray County Food Shelf, Murray County Hospice, Meals on Wheels, MCC Lunch buddies, Daffodil Days Chairman and Election Judge. Gail was a member of the Lake Wilson American Legion Auxiliary and the Red Hats. Gail enjoyed spending time with her family, coffee with friends, attending her grandchildren’s activities, reading, making lefse, apple pie and family holiday meals. Survivors include her husband, Larry Byers of Slayton, MN three children and their spouses, John and Jaynee Byers of Mosinee, WI, Sarah and Eric Dahlgren of Hadley, MN, and Brian Byers of Slayton, MN, six grandchildren, Adam and Marcie Byers, Megan and John Felker, Erica and Kellen Bernhardt, James Dahlgren, Angela Dahlgren, and Vanessa Dahlgren, seven great grandchildren, Ava, Alexis and Jackson Byers, Beckett and Madelynn Felker, and Bristol and Beckham Berhardt, one sister, Mary Voorhees and her husband, Ritchie of Appleton, MN, three sisters-in-law, Karen Onken of Slayton, MN, Carole Schmitz and her husband, Marion of Eugene, OR, Dorothy Byers of Slayton, MN and several nieces and nephews. She is preceded in death by her parents, one brother, Gary Onken, one brother-in-law, Doug Byers one sister-in-law, Sylvia Byers, and one niece, Lisa Belloni. Trinity Lutheran Church in Slayton, MN on Monday, April 1, 2019 at 10:30 a.m. with Rev. Shawn Ethridge and Rev. Dennis Brech officiating. The organist is Brenda Whitehead with special music by Heidi Winter. The pallbearers are her grandchildren. Interment is at Slayton Memorial Gardens in Slayton, MN. Visitation will be on Sunday, March 31, 2019 at Trinity Lutheran Church in Slayton from 4-7 p.m. and also one hour prior to the services at the church on Monday. Totzke Funeral Home of Slayton is entrusted with arrangements. Memorials are preferred to Trinity Lutheran Church in Slayton, MCC Music Boosters, MCC Theater Department or the Slayton Library.